Lying Liars At Fox News Reverse Gallup Poll Result On Collective Bargaining - Joe.My.God. 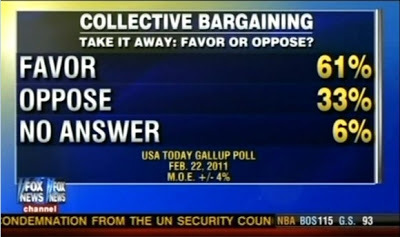 Americans strongly oppose laws taking away the collective bargaining power of public employee unions, according to a new USA TODAY/Gallup Poll. The poll found 61% would oppose a law in their state similar to such a proposal in Wisconsin, compared with 33% who would favor such a law. Republican Gov. Scott Walker and Republican legislators in Wisconsin have proposed cutting union rights for most state government workers and making them pay more for benefits. Ohio, New Jersey, Indiana, Iowa and other states with Republican governors are considering similar laws. Don’t expect Fox to issue a retraction. UPDATE: Media Matters has updated their above-linked post to note that Fox DID retract the above graphic. I’m shocked, truly.